Roman Atwood is a popular YouTube personality famous for pulling pranks. His girlfriend, a repeated victim of Atwood’s hoaxes, was tricked again when he pretended their three-year-old son was killed in a fiery explosion. Is it really necessary? The video shows Atwood and his son Kane riding around on a used ATV when his girlfriend shows up to inspect it, according to PIX11. When she heads back to her car to retrieve payment, Atwood switches out their son with a dummy wearing the same clothes. As the mom comes back, the vehicle takes off with the fake child on the seat. The four-wheeler jumps over a hill and causes a dramatic explosion. 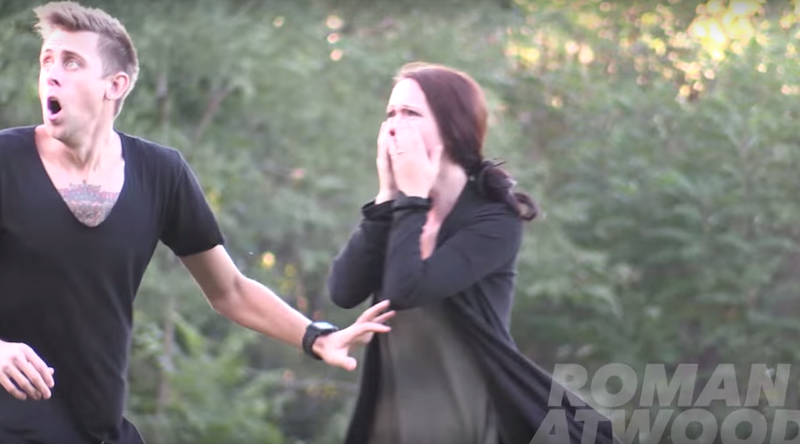 After running to check on the crash, she soon realizes it was a prank. “Don’t touch me, I am done,” she says to Atwood. So far, the video has reached over 9 million views, meaning this guy more than likely has his pockets filled. This isn’t the first time the YouTuber has used his son as a prop for pranks. Last year, Atwood tricked his girlfriend by pretending he threw the child over a second-floor balcony. It’s not clear whether or not Atwood’s girlfriend was in on his latest prank or any of them, but it raises the question whether it’s a good idea for a young child to think it’s okay to scare the living crap out someone. Then again, millions of views and an estimated $100,000 monthly paycheck can make people do the stupidest things. At least they’ll have enough cash for the kid’s therapy when he gets older. My question is, when did an ATV become a cooler ride for toddlers than a good, old-fashioned Power Wheels?